Explanation: How common are planetary systems like our own Solar System? 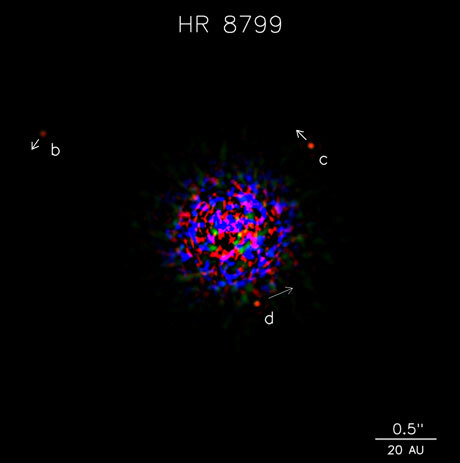 In the twelve years previous to 2008, over 300 candidate planetary systems have been found orbiting nearby stars. None, however, were directly imaged, few showed evidence for multiple planets, and many had a Jupiter-sized planet orbiting inside the orbit of Mercury. Last week, however, together with recent images of Fomalhaut b, the above picture was released showing one of first confirmed images of planets orbiting a distant Sun-like star. HR 8799 has a mass about 1.5 times that of our own Sun, and lies about 130 light years from the Sun -- a distance similar to many stars easily visible in the night sky. Pictured above, a 10-meter Keck telescope in Hawaii captured in infrared light three planets orbiting an artificially obscured central star. The 8-meter Gemini North telescope captured a similar image. Each planet likely contains several times the mass of Jupiter, but even the innermost planet, labelled d, orbits out near the orbit of Neptune. Although the HR 8799 planetary system has significant differences with our Solar System, it is a clear demonstration that complex planetary systems exists, systems that could conceivable contain an Earth-like planet.